An extension to the School of Arts was erected in 1938 to commemorate the late King George V.
George V (1865 – 1936) was King of the United Kingdom and the British Dominions, and Emperoro of India, from 6 May 1910 until his death in 1936. The tangible, satisfying and valuable result of a fine community effort, the Deepwater memorial to the late King George V., comprising extensive additions to the local School of Arts building, was officially opened yesterday afternoon in the presence of a large gathering. Erected at a cost expected to exceed £400 — more than half of which was raised locally — the new buildings comprise a brick built card and meeting room on the northern front of the recreation building, and a large supper room and kitchen, extending behind it for the full length of the hall. The opening ceremony was performed by the Deputy Premier, Col. M. F. Bruxner, who in expressing admiration of the district's response to the appeal for funds, congratulated the committee on their choice of a form of memorial most apposite to the expressed wishes of the late King, and one in keeping with his late Majesty's continued interest in the recreation and sporting activities of his subjects. Col. Bruxner spoke most interestingly of the knowledge he had gained in his recent visit to England of the affection and loyalty in which the members of the Royal Family were held, contrasting their quiet secure movement among their people with the regimented acclaim of heavily guarded dictators of other European states. The late King George, Col. Bruxner said, was a very wonderful man. He was the plainest gentleman in all the world, and probably because of that, the most beloved. It was his hope, he added, that the people of Deepwater would continue to think of the were as a memorial to their late King, and that they would try to pattern themselves on the life and manners of the man in whose honour it was built. 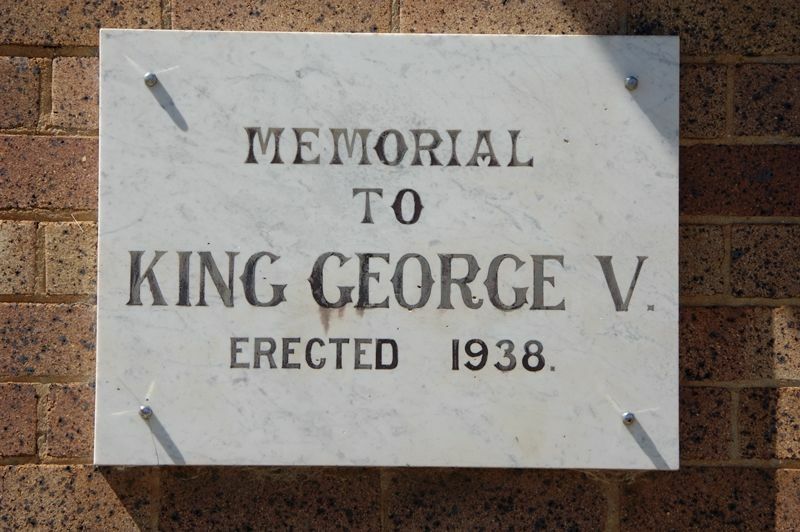 Prior to the official opening, which was performed at a banquet in the new supper room, Colonel Bruxner unveiled a simple tablet on the front of the new meeting room which bore the words, "In Memory of the late King George V. Erected 1938." Glen Innes Examiner (NSW), 5 November 1938. 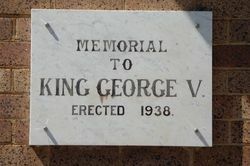 Memorial to King George V.